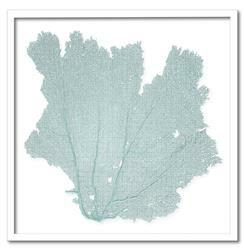 This beautiful small framed sea fan was harvested from the ocean and tinted a delicate blue haze shade by hand. The delicate lines and organic shape make it the perfect choice for contemporary and nautical-inspired spaces. This item is made to order, please allow up to 3 weeks for production.